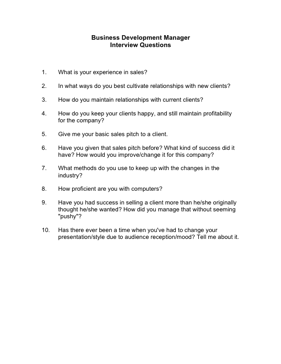 Choose your next Business Development Manager with the aid of these helpful interview questions. 1. What is your experience in sales? 2. In what ways do you best cultivate relationships with new clients? 3. How do you maintain relationships with current clients? 4. How do you keep your clients happy, and still maintain profitability for the company? 5. Give me your basic sales pitch to a client. 6. Have you given that sales pitch before? What kind of success did it have? How would you improve/change it for this company? 7. What methods do you use to keep up with the changes in the industry? 8. How proficient are you with computers? 9. Have you had success in selling a client more than he/she originally thought he/she wanted? How did you manage that without seeming "pushy"? 10. Has there ever been a time when you've had to change your presentation/style due to audience reception/mood? Tell me about it.